Journey across the Nullarbor aboard the Indian Pacific before you circle the top end of Australia as you cruise from coast to coast. Experience the fantastic stretch from Perth to Sydney by rail aboard the comfort of the Indian Pacific. Relaxing overnight break in Darling Harbour, Sydney. Amazing 17 night cruise with countless ports of call. 3 nights aboard the Indian Pacific travelling from Perth to Sydney in Gold or Platinum Service. Your journey includes all meals, drinks and off train experiences in Kalgoorlie, Nullarbor, Cook, Adelaide, Broken Hill and the Blue Mountains. 1 night stay in Sydney at Parkroyal Darling Harbour including breakfast. 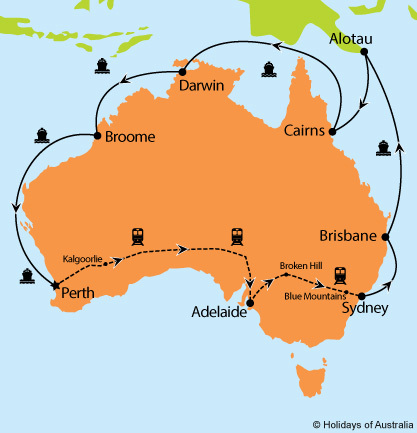 17 nights aboard Sea Princess cruising from Sydney to Fremantle with scenic cruising along the Kimberley Coast and port calls in Brisbane, Alotau, Cairns, Darwin and Broome. Includes on board meals and entertainment.